Enjoy higher efficiency and lower heating bills with the Flush Wood Plus, the first and best completely flush wood fireplace insert on the market. This medium sized insert provides extraordinary heat, and its classic architecture along with the large viewing area of the single door are complementary to virtually all styles. 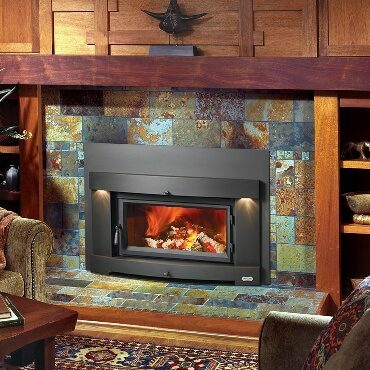 The Flush Wood Plus features a three-sided convection chamber, a 6" seamless flue collar and a kiln-fired refractory firebrick interior, making this wood insert very high in quality with exceptional heat transfer. The heat is evenly distributed by a 180 CFM convection fan that can circulate warmth up to 2,000 square feet. Its advanced combustion system also provides fires that burn longer and more efficiently, with less wood and burn times up to 10 hours. The Flush Wood Plus is available with the GreenStart patent-pending ignition system for the modern wood burner; just load your wood and push a button! We've completely eliminated slow, cracked open door startups and laboring over fickle newspaper.